(CNN) -- The first bodies to be recovered from the crash of Air France 447 arrived at a Brazilian Air Force base in Recife, Brazil, Wednesday, the air force announced. 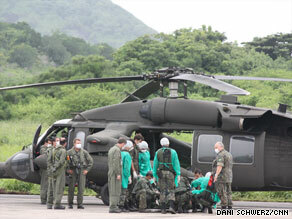 Brazilian pilots and a medical team bring one of the first bodies ashore at Fernando de Noronha island. The 16 bodies were taken to the Legal Medical Institute in Recife for identification, the statement said. Police will perform DNA tests at their lab in the capital, Brasilia, if necessary, they said. Another 25 bodies have been found and will go through the same procedure starting Thursday, the air force said. Official identification of the bodies will be made only by the Legal Medicine Institute, even if any of the bodies could have been identified while on Fernando de Noronha, the islands where they were first brought after being recovered. A French nuclear submarine joined the hunt Wednesday for the flight data recorders and other wreckage from Air France Flight 447 as Brazilian air force and navy crews continued to pull bodies from the Atlantic. Bad weather and poor visibility are expected in the search area, Brazilian Air Force spokesmen said. France is leading the investigation into what caused last week's accident when the Paris-bound flight from Rio de Janeiro plunged into the sea off the Brazilian coast with 228 passengers and crew on board. The French nuclear submarine Emeraude began patrolling the area Wednesday morning, the French defense ministry said. Around 400 French military personnel are involved in the salvage effort. France has also sent two tugs towing 40 tons of recovery equipment, a surveillance ship and a ship equipped for amphibious operations. Fourteen aircraft -- 12 Brazilian and two French -- are participating, along with five Brazilian ships. The U.S. Navy will contribute two high-tech acoustic devices to listen underwater for the emergency beacons that are attached to the voice and data recorders. Brazilian officials emphasized earlier this week that finding bodies was their main priority. The French are in charge of finding the voice and data recorders. It was not clear whether the bodies had drifted in the 1-2 knot currents or whether their separation suggested that the jet may have broken apart in the air. The ocean depth where the debris and bodies have been found varies, but averages about 3,000 meters (nearly 9,900 feet) deep, according to the University of New Hampshire/National Oceanic and Atmospheric Association Joint Hydrographic Center. Brazilian officials said the plane debris will be taken to France for investigation but the bodies would undergo forensic tests in Recife. Another Air France pilots' union, ALTER, has advised its pilots not to fly planes until their Pitot tubes are replaced. ALTER, the smallest of three Air France pilots' unions, would not say what percentage of the carrier's pilots it represents. Air France decided to replace all its probes starting April 27, following laboratory tests earlier in the year, the airline said.